Bill Murray heads to Afghanistan in director Barry Levinson's dreadfully misguided farce. Whatever its faults, Rock the Kasbah is a true Bill Murray vehicle, and his voice comes through strongly throughout. 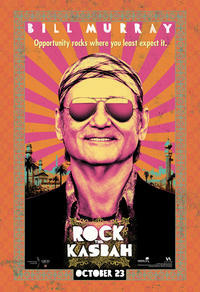 All hail Bill Murray, who does wonders for this comedy about a rock manager on the comeback trail. Même si les images sont jolies et que la jeune Salima a beaucoup de talent, l'histoire est sans grand intérêt. On trouve donc le temps bien long lors de cette interminable virée en Afghanistan. Brouillonne et paresseuse, sa réalisation souligne davantage les carences du scénario. Aux côtés de Bill Murray, qui nous refait le coup du gars blasé, mais avec encore plus de nonchalance que d'habitude, la talentueuse Leem Lubany se contente d'offrir de charmantes versions de grands succès de Cat Stevens. Murray knows this character like the back of his hand and frequently hits amusing notes in the role of a not-so-innocent but still oblivious fool who is forced to confront his pathetic reality everyday and barely, just barely, gets by without dealing with it. Barry Levinson‘s comedy is mostly a schtick delivery system for his star. Just when I was ready to give up on “Rock the Kasbah,” she performs a gorgeous version of Cat Stevens’ “Peace Train” and—in the context of the movie—the words to the ‘70s easy-listening staple shine anew with fresh relevance. Your enjoyment of all this will probably depend heavily on your willingness to let the words romp and Taliban coexist for approximately two hours.